Today some wonderful inks for Ornamental writing are available. These preparations hearken back to legendary inks such as Arnold's, Carter's and Zanerian brands. EW Bloser (1865-1929) wrote, "Never stir the ink. A sediment will gather at the bottom of the well which should never be stirred up. Draw a strip of paper across the surface to remove dust, scum, or crust. When it gets too pale or muddy, clean the well thoroughly and refill..."
Modern ink alchemists such as our own Brian Walker (Walker's Copperplate Ink) and Neil McCaffery (McCaffery’s Penman’s Ink: Black) produce iron gall type inks. Unlike some ink preparations that require stirring, the sediment that gathers at the bottom of the bottle should NOT be stirred or mixed prior to use. The reason is that the pigment in these ink preparations is metal. 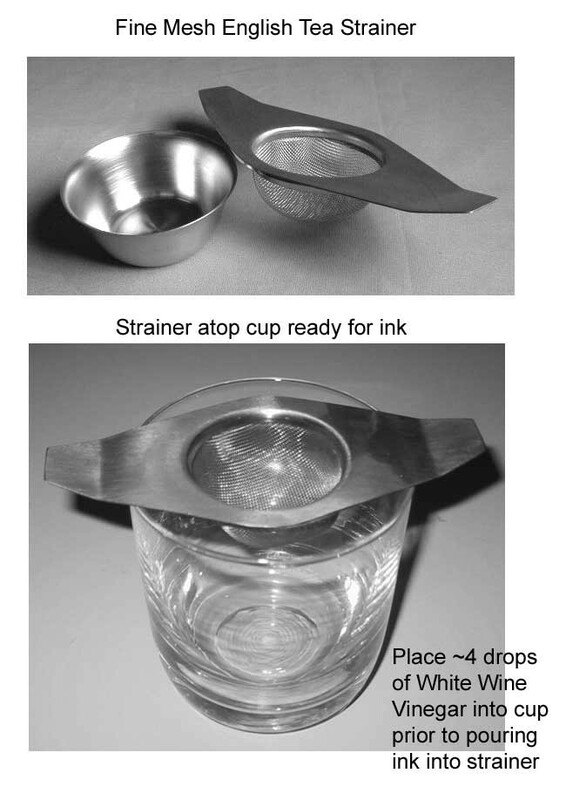 When the ink is fresh the metal, usually iron, is dissolved and ‘in solution’. The acidity of the ink helps keep the pigment dissolved in solution. When iron gall type inks are exposed to air after writing the metal will precipitate ‘out of solution’ and deposit on the surface. Once this occurs it will not re-dissolve. This can happen in the bottle as the ink ages and a precipitate or sludge will build up on the bottom. The relatively large and irregular particle size makes attempting to resuspend the sludge impractical and writing impossible. As the ink gets older some of these insoluble particles can float on the surface and cling to the nib when dipped into to the ink. Iron gall inks were occasionally ‘freshened up’ by adding a few drops of an acidic solution such as vinegar or lemon juice. Add 4 drops of white wine vinegar to the bottom of an empty glass cup. Set a 'fine mess' tea strained atop the cup. Gently pour the ink into the being careful not to disturb the sludge. If the sludge falls into the strainer do not attempt to break it up. Just let it drip for a minute or so undisturbed. Thoroughly rinse out the ink jar and pour the refreshed ink back into the jar. I will usually add new ink to the refreshed older ink to help replenish the lost pigment.